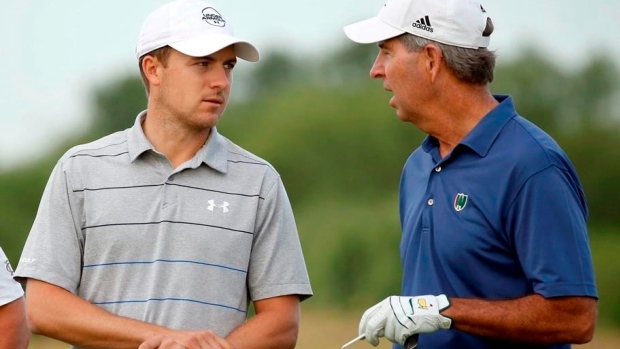 DALLAS — Jordan Spieth didn't try to sell his peers on joining him at a new links-style course for the 50th anniversary of his hometown AT&T Byron Nelson tournament. "The most common question is, 'What's it like?'" Spieth said. "Pretty vague question but, you know, I say it's very different. These are my words: It's really fun as a member, as a change-of-pace kind of golf club." Spieth (No. 3) and ninth-ranked Hideki Matsuyama, making his Nelson debut Thursday, are the only players from the world top 10 in the field. Sergio Garcia, the Nelson winner two years ago and 2017 Masters champ, is next at 14th. "Look, most people just don't like different, do they?" asked Adam Scott, the 2008 Nelson champ playing the event for the first time in six years. "This is just different than what we normally roll out and play."